We went to our local botanical gardens mostly just to see their Christmas lights and decorations but within minutes I realized we were having a wonderful winter science lesson! 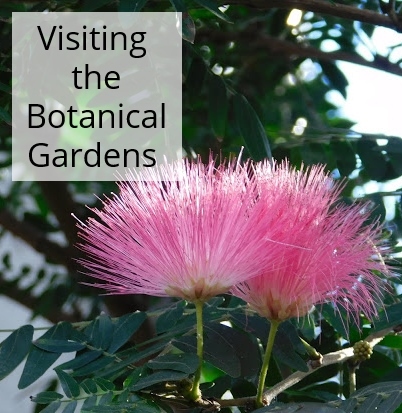 Our botanical gardens have so many wonderful and unusual varieties of flowers and plants and we had a great time checking them all out. We read many of the signs and the scientific names. We noticed which plants shared some common traits. Took note of all the different textures and colors and sizes of plants. It was great! The gardens had a few bug hotels set up outside in different common areas and the boys eagerly read up on them, how they made them, and what they are used for. Your photos are so beautiful. I love wandering around botanical guardains. We live near some really nice ones. Thanks! This is the second one near us that we've found and we have so much fun wandering around. How beautiful! Atlanta supposedly has an amazing Botanical Gardens and I'd love to take the kids this Christmas. Our local one is lovely, too, but it's not as spectacular as the one in Atlanta. And I love how you turned this into a lesson! That is the best way to learn! It really is! I just love finding new places to explore; those are the lessons they tend to really remember. I enjoyed your photos on this grey, cloudy, rainy day in the Midwest. Thank you for sharing! Thanks for stopping by! We have a pretty cloudy day too but no rain yet. Thank you for this breath of spring! I think that is one of the reasons why we enjoyed visiting so much! Nothing like a little taste of spring in the winter. Beautiful photos, your botanical garden is lovely. Thanks for sharing! Thank you! I felt like I could snap away all day. I love spending time at our Botanical Gardens. All of your photos are lovely! Thank you! I've been trying to play with my camera more often. What a beautiful place to visit. I would love taking photos here of all the flowers :) Thanks for sharing at The Wednesday Blog Hop.